Jockey's Ridge in Nags Head, NC is the place to hang glide on the Outer Banks. Learn the sport from professional instructors, or hone your skills on the largest sand dune on the east coast! Learn to fly at Kitty Hawk Kites' Hang Gliding Training Center. The largest hang gliding school in the world, teaching hundreds of thousands of students since 1974! Teaching students aged 8-80, male and female, physically fit and physically challenged. In fact, Kitty Hawk Kites can accommodate paraplegics, blind, deaf and other physical challenges. All that is required is a desire to fly like the birds. Beginner, intermediate and advanced instruction is available. Dune Lessons are conducted at the training facility in Jockey’s Ridge State Park in Nags Head. 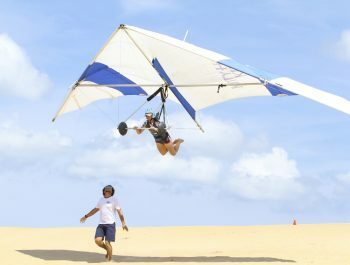 The dunes of Jockey's Ridge provide the perfect platform for learning to hang glide. They have plenty of height for beginners, and are soft for landing. Weight minimum of 85 lbs. Weight maximum of 225 lbs. Tandem Lessons allow you to fly to altitudes of 2000 ft. or higher with a certified instructor from our tow site at Currituck County airport. The student and instructor are hooked into the glider together. An ultralight plane tows you to altitude, the glider is released, then you and your instructor glide back to the airport where you land like a plane. No experience is necessary and hang gliding tandems are handicap accessible.